Kelly Piacenti is a mom to four – Allie, Olivia, Nick, and Frankie. Kelly is the Assistant Vice President, MetLife Center for Special Needs Planning, and a member of The Arc’s national board of directors. This Mother’s Day, we caught up with Kelly about what being a mom of a child with significant disabilities means to her, and how The Arc is a part of her life. How did you and your family get to know The Arc? Back in college, I worked in a group home in Massachusetts. I was going to school to become a social worker, and for four years I worked with people with intellectual and developmental disabilities. I used to take those individuals to activities run by The Arc. So I knew about The Arc long before I had Nick. When Nick was born, they told us to expect him to live a few months. Then they said to set our sights on 2. On January 7th, my Nick turned 14. He has defied the experts. In my line of work, I travel all over the country and I get to see what chapters of The Arc are doing. Most recently, I visited The Arc of Hawaii and The Arc of Anchorage. 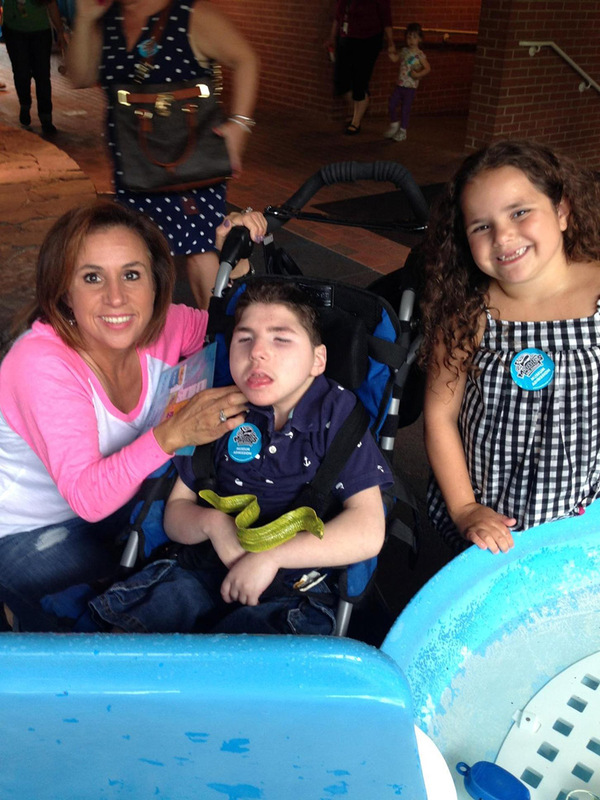 What does it mean to be a mom of a child with very significant disability? I thought I had it all before Nick – two kids, a house, both my husband and I had great careers – but Nick really put life into perspective. For a while, you feel like everything is falling apart – but then we woke up, and realized what Nick gives us. Nick’s smile means a whole lot more than many people’s words. He gives us the ability to focus in on what’s important. I just want all my kids to be happy and I want to provide them a good quality of life. The things I worried about before – spills on the rug, getting someone to soccer on time – I don’t worry about now. Nick has taught me more than I’ve taught anyone else as a mom. As a member of The Arc’s national board, I’m all about the people with I/DD and the families that don’t feel like they have a voice. There’s a core group that just need support – information, a way to talk to each other, a connection. My family is very fortunate. I’m there on the board to advocate for people like Nick that don’t have the resources, time, or energy to fight for what they need. Before Nick came into our lives, I didn’t have this in me – Nick gave me this ability, this drive. What type of support do you receive from The Arc and from others in your family and community? I’m a member of my local chapter, The Arc Morris in Morris Plains, New Jersey. I’m involved because I get so much information from The Arc locally and nationally. Nick doesn’t get services from my chapter – he may never – but it’s valuable to my family because of the depth and breadth of knowledge within The Arc’s network. I read The Arc’s website because I know it’s a fantastic source of information on all kinds of topics out there. I respond to their Action Alerts because while Nick may not be receiving the services in jeopardy now, he may down the line. When families of children with significant disabilities call me, they crave information. I tell them The Arc’s website is the place to go. What support would you like to receive that you aren’t receiving — how can we at The Arc do better to include people with the most significant disabilities and their moms and families in our work and our lives? I talk to a lot of families with family members with significant disabilities in my role with The Arc and my career at MetLife. Many of them discount organizations like The Arc because they don’t utilize the services they provide. But they also need information, and a connection – and The Arc provides that. I think we need an online place to communicate – a blog or forum where families can talk to each other. For those of us who are parents of children with significant disabilities, it’s all about the quality of life and seeing what’s out there. We need to connect and we can lean on The Arc’s expertise. From The Arc, I follow what’s going on with states setting up ABLE accounts, where there could be sibling group opportunities for my other kids – it’s about seeing what’s out there for us. The Arc can and should capture the interest and engagement of all families. Do we know who is on our site at 2am looking for information, but may not be connected to a chapter? We don’t – and we should be reaching those people and engaging them. I think all families can get involved with our advocacy work. Our Action Center is full of information to educate yourself about the policy issues that impact all people with I/DD. It’s just a matter of making those connections to these silent families.